Sadly no tektites - I searched high and low with the thought of the tektite papers by Lacroix between 1929 and 1935. The tektites must be somewhere! With the French colonial history in Indochina and northern Africa (although not specifically the area in which Libyan Desert Glass is found) I was anticipating great displays of Indochinites and Libyan Desert Glass. I was wrong! 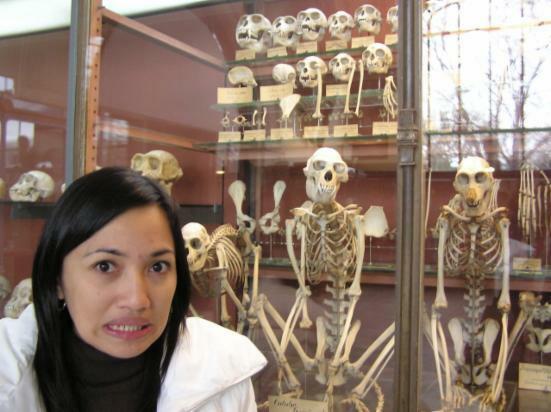 Now I'm being harsh with museums. 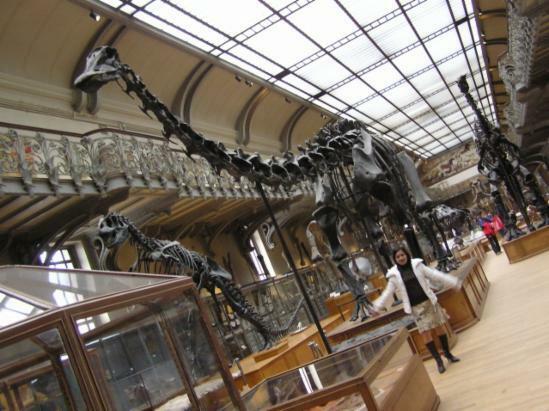 Paris is a nice place, the Louvre is very nice - nice glass pyramid and pictures (Mona Lisa :-( ) and Egyptian stuff (couldn't see any LDG in those artifacts btw), but the Natural History museums, especially the Palaeontology museum, are run down. Overall they are good: the specimens haven't been thrown out and replaced by computer animations and funky simulations. This makes me happy, but in fact nothing has been done - at least paint the walls - no, at least just dust the walls, people are writing their names in the dust! Mars represents one of the few places where there might be the correct conditions to form tektites. To form a tektite you need a silica rich source rock. Silica is typically concentrated by weathering and then water and wind transportation to form sandstones, siltstones and claystones and their metamorphic equivalents. 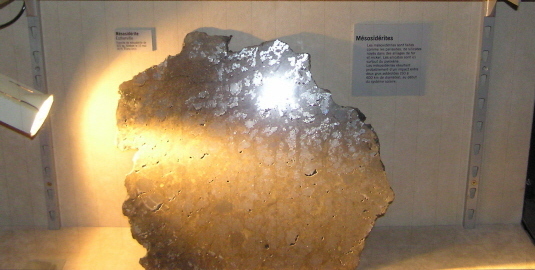 ABOVE: Close-up of the Martian meteorites. 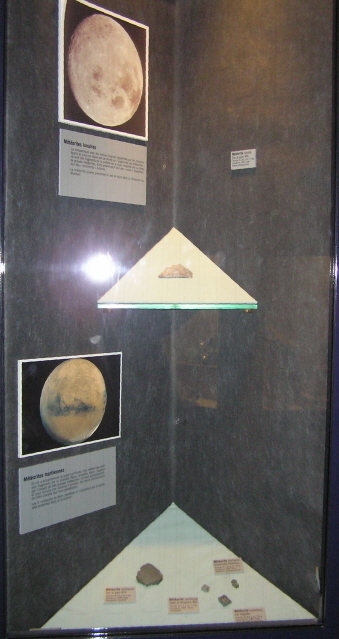 ABOVE: Lunar Dar Al Gani 400 at top, Martian meteorites at bottom. ABOVE: A collection of Irons and Stony-Irons. 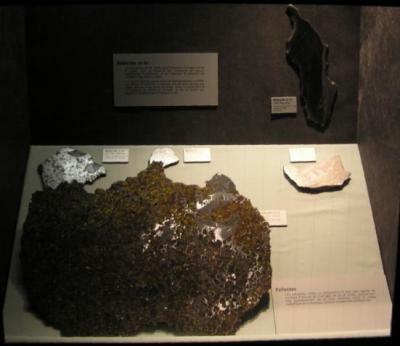 The pallasite is Ilimac. Udei Station top left and Roundup top right - on the wall. Not sure of the other two on display. 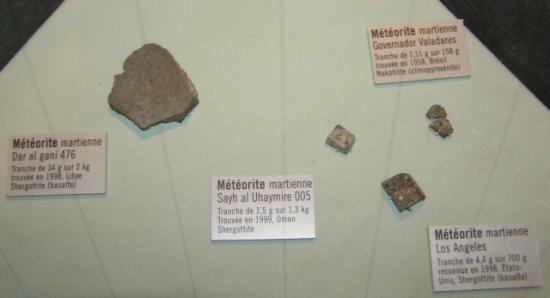 ABOVE: Chondrites - Abee (EH4) and an NWA (L3); Achondrites - Smara (Eucrite), Bilanga (Diogenite) and Dar Al Gani 779 (Howardite); Mesosiderites - Estherville. From 1929 to 1935 Alfred Lacroix wrote a series of papers on the tektites from Indochina, Cambodia, Philippines and the Ivory Coast. I was rather hoping to see some of his specimens in the museum! 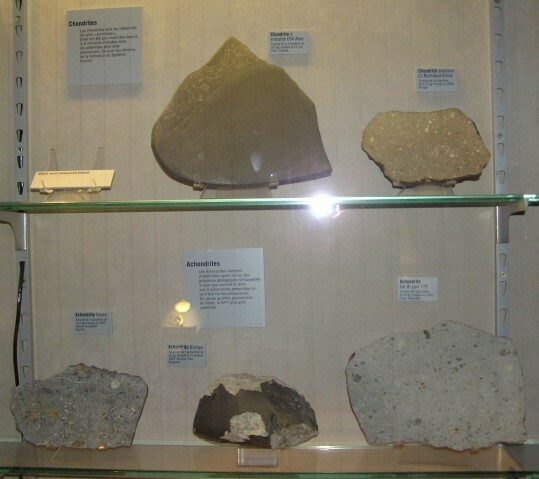 The Palaeontolgy Museum is just a short walk from the Mineralogy Museum.